Hi Laurie. Thanks for sitting down with me and letting us peer into your process. Here is my first question. Actually they are kind of groups of questions so feel free to wander where your answer takes you. All tangents are welcome. When you begin the process of bringing a children’s book to life, how do you make sure that the image of each character and setting are true to the author’s inspiration? Do some authors give you storyboards or do you usually take the lead? And to that point; do you give the author rough sketches before you commit to a concept? The answer to all of this is – with all the books I have illustrated (7 children’s picture books to date, with 2 more to come next year) I actually never meet or discuss anything with the author. All my interaction and creative discussions are with the publisher. This always surprises people. And, to be fair, I don’t know how other illustrators (or publishers for that matter) work. This has just been my experience. The publisher (in my case, Sylvan Dell Publishing) sends me an e-mail telling me they have a manuscript they think suits my style and would I be interested. I immediately say “YES” (well, once I didn’t, but we can get to that later) and they send me the manuscript. In a way, Sylvan Dell has already decided what they think the character and setting should look like and pick an illustrator whose style is compatible. I have never specifically asked them how they choose any given illustrator (for all I know I was the last name on the list and the only one who said yes) but I do have a certain way of drawing and problem solving so I’m sure that gets factored in. As far as being true to the author’s inspiration, while I certainly attempt to follow the mood of the story, and illustrate what is being described, I am pretty much given free rein to approach the story from my own unique perspective. 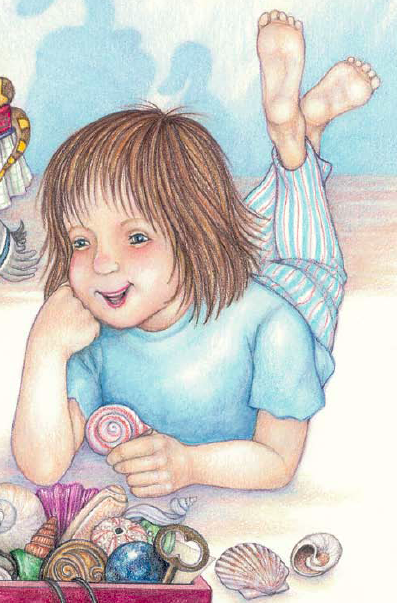 Case in point – in Janet Halfmann’s book, “Fur and Feathers”, Janet wrote about a little girl named Sophia and I assume she had a particular child in mind when she was writing. However, when the manuscript came to me I immediately thought of MY daughter and planned to use her as the model for the character. Of course my “little girl” was now an adult, but I have 50-plus albums full of photos so i planned to use those as my reference. Ironically, when I did the finished color art for the cover (the finished cover is sent before I go on to interior illustrations) my pencil slipped just a bit and the little girl wound up looking nothing like my own child. I thought the new face was cute (and basically didn’t want to start the illustration all over) so just kept that completely made-up character throughout the rest of the illustrations. Also – at the end of the story, when we meet Sophia’s grandmother, the woman in the illustration is my mom. As for storyboards (I call then “thumbnails”) and rough sketches, I do indeed supply those to the publisher for approval before going to finished color. It is only after all the illustrations are completed, and the book is ready for proofing, that the publisher lets the author and I meet/talk to each other. 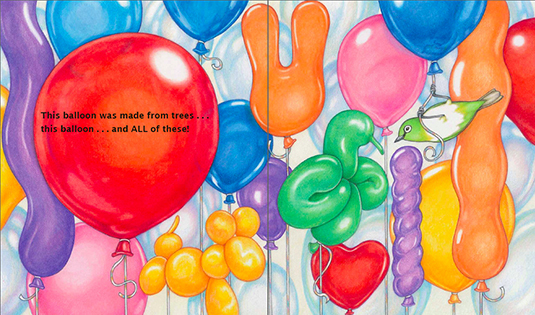 Fortunately, so far, to the best of my knowledge none of my authors has been disappointed with the illustrations. Have you ever considered writing your own children’s book and illustrating it? Yes! Every single day since I was a little kid. I have tons of notebooks and folders full of characters and plot ideas and story snippets but, sadly, I have the attention span of a flea and keep hopping from one idea, or new obsession, to the next and can never quite settle down to actually write a full story. Hope springs eternal however, and being an Author-Slash-Illustrator is my Holy Grail dream. Do you ever hit a roadblock in the creative process? What sort of tools do you use to break through? Certainly. Some illustrations just leap off the page, others take more thought, but both go thru the same process of scribbly little doodles where I rough out the design. I generally do tons of research before I actually start drawing, so often I already have an idea of what I want to do, or how the page should look. In Meet the Planets, for example, I used 15 books, 13 magazines, 3 CDs, and a statue for inspiration. Then I just keep fine-tuning the rough sketches, cleaning them up each time until I’m satisfied. I can easily do three or four sketches (or more) before I get the one that’s right. Often, during this process, I decide a picture looks flat or boring and will dive back into research hunting for a different perspective or more interesting point of view. And when I really hit a wall I’ll thumb through my books for inspiration (I have floor to ceiling bookshelves in almost every room, so I have lots or reference materials). And sometimes, just walking away for a day helps. I have left an illustration that I felt was hopeless and come back the next day only to discover it wasn’t so bad after all. Is pencil your prominent medium? Do you ever use paint or pen? My first, true love is plain old black and white #2 pencil and I hope one day to do a children’s book (or any book) in that medium, but I also work in ink, paint (acrylic), and scratchboard. I have painted wall murals and love to do faux textures and trompe l’oeil work in paint, and one book, “Little Skink’s Tail”, was done with acrylic paint on canvas, but when it comes to coloring illustrations Prisma color pencils are my usual Go To medium of choice. I like the immediacy of the pencil in my hand, and prefer blending the colors right on the page, as opposed to off on the side on a palette. And I love the wonderful sharp point I can get for detail work. All that being said, ironically (my life is full of them) I really do not feel very confident using color and very often do not really know what I’m doing when I go to color an illustration. I don’t do any sort of comps before hand (though I probably should) so a lot of the time I’m truly just winging it. Of course after 25-plus years doing freelance art of one sort or another I DO have a fairly good working knowledge of what will probably happen, or how I might achieve a specific look. And I have learned to just keep bulling through if I hit a snag. Again, tons of references help. I also go to “How To” type books (Color Pencil for Dummies kind of manuals) when I’m not sure how to achieve something. How do you get such rich, defined color with your color pencils? Your images seem to be both vibrant and soft at the same time. To be honest – I really don’t know! I don’t even recall how or when I started using Prisma color pencils exclusively, but I do know that, at the start, I could pretty much use any kind of paper and achieve the look I was going for. I learned a couple of blending tricks along the way, and slowly added to my ever-growing supply of pencils, and everything was fine. And then – suddenly – right about the time I started work on “If A Dolphin were A Fish” nothing seemed to work right. The paper didn’t seem to take the colors the way they once had – they were too faint, or too grainy. I struggled with that for a couple of years, trying different papers with random success. I eventually stumbled upon a paper called Stonehenge that works pretty well, and more recently Strathmore’s Mixed Media paper, but it’s still an ongoing struggle to find the right combination of tooth and texture – not too slick, not too grainy – to get the colors just right. I half wonder if different batches of pencil or paper account for the fluctuation but when I find something that seems to work I just keep using it. Again – I don’t really know how I achieve the final look but I do know the steps I take. Often I start with Black Grape to do the lines and shadows, then I apply layers of whatever combination of colors I think will work (coloring real things is the easiest – the color choices are already established). I use a really sharp pencil and try to keep the coloring as smooth and consistent as possible. Obviously, with pencil, you’re going to get a certain amount of grain or texture (or at least I do) so I try to use that texture in the illustration, to indicate movement or fur or whatever, if possible. I use different colors, or lighter versions of the main color, to blend and smooth the surface, but one can also use white or a blending pencil. The best trick I learned for blending is using Odorless Mineral Spirits – it kind of makes the color pencil react almost like water-color. Layering and blending the color, or colors. I use a lot of colors – it might be Black on top, for example, but underneath there could be a layer of Tuscan Red, and Indigo Blue and Dark Green. 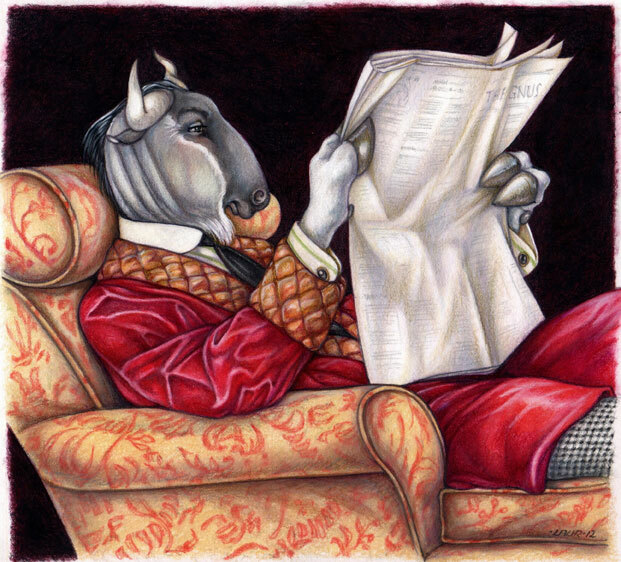 One of my favorite images in your museum of work is the Gnu, in a smoking jacket, reading the newspaper. Where did that specific combination of images come from? It’s so perfect, up to and including that stark black background. That is one of those – lightning in a bottle/divine inspiration/it just all fell right into place pictures that pretty much came about on a whim. I had been talking to the amazing, talented, brilliant guy who does my web site (I have absolutely no technical or computer skills so have Tech Support Wizards on speed dial) about having some sort of feature or icon to announce when something new had been added. My web site is pretty static (I think of it as an on-line portfolio to show potential clients samples of my work) and the only time it changes is when I add a new piece (usually my annual Christmas card) or write a blog post, so I wanted to come up with a way to let people know there was something new on it. On the drive home from the web guy’s office I started mulling over the What’s New title and thought of all the play-on-word versions of “New” – like newt and, naturally, gnu. Immediately the image of a gnu reading a newspaper (or gnuspaper) came to mind, and when I say image I mean – literally – a specific image. My gnu is based on an Arrow Collar shirt ad from the 20s that was done by the brilliant J. C. Leyendecker, so truthfully any success in the picture is owed to him! It turned out I never found any way to really use the finished picture on my web site but I loved the image and have since turned it into a What’s Gnu? promotional postcard. So the new news will still eventually find an audience. Well the image certainly found an audience in me. Are you a fan of art museums? If so what are some of your favorites? Do you find inspiration in the work you see there? I am a fan of ALL museums, every shape and kind and description. Art, natural history, aeronautic, crafts, toys, radio and television, nature, you name it – I like it. And aquariums. And zoos. And theme parks. And behind-the-scenes tours. And book stores. And really good art supply stores. “I love a little shop” (that’s a quote from Doctor Who). Really – wherever there is a collection of anything I’m there. And yes, I’m inspired by everything! In some form or another it all gets stored in my mind, bubbling up again when needed. Ok. Last question. Dogs Playing Poker or Andy Warhol’s Tomato Soup Can? Dogs Playing Poker – hands down (or should that be paws?)! I had a feeling you’d say that. Hey, thanks so much for taking the time to chat with us, Laurie. Do you have any future projects brewing to leave us hanging with? Thank YOU so much for having me. I love, love, LOVE talking about art and books and the illustration process (or polar exploration, ancient celts, standing stones, wizards, Doctor Who, science fiction, time travel, Star Wars, whales, music, Natural Philosophers, mythology, Charles Dickens, Sherlock Holmes, Agatha Christie, history, travel – to name but a few additional obsessions and passions) and welcome every opportunity to share stories. As for future projects. Right now I am working on coloring the illustrations for my 8th children’s book for Sylvan Dell Publishing that will be coming out next fall (3 done, 10 more to go). And then after that I have another children’s book to start drawing. And there’s always some other unexpected project that pops up. Just the other day, for instance, I was asked to paint a plastic garbage can to look like an old barrel. I never know what a day will bring, but I’ll keep you posted!!! Best of luck in all future endeavors. We’ll be keeping you on our radar! All comments and questions are welcome, including your own answer to the question “5 Dogs Playing Poker, or Andy Warhol’s Tomato Soup Can?” What’s on YOUR mind? Time for Summer READING with Grambo!